Playtime is a serious business when you’re a baby. I don’t mean I’m hot housing Baby B by the way. But I’ve noticed the amount of effort and concentration he puts into what we call playing. I haven’t written about playing before and I think that’s because I hadn’t really noticed what he was doing until the past couple of months. In the early days he had the usual playmat, rattles, a few cuddly toys but seemed more interested in playing with his hands and feet, our hands and faces, his own socks and, when he was in the garden in the summer, handfuls of grass. Once he was on the move he wanted anything he could get his little paws on, but none of the things we referred to as ‘toys’. No. Like many crawlers I suspect, Baby B wanted play with wires, sockets, the TV, the remote, any breakable objects we failed to move out of reach etc. Well Baby B is ten months old now and he was given A LOT of toys for Christmas. I read and laughed along with this blog post by Three and Me about the mound of plastic tat babies are given and routinely ignore. Well, I do worry about waste and our throwaway society so the influx of STUFF into our house and how fast it becomes obsolete has been very much on my mind this past year. So when it came to choosing toys in December I wanted to buy him something that would be fun now and hopefully last well into his second year. 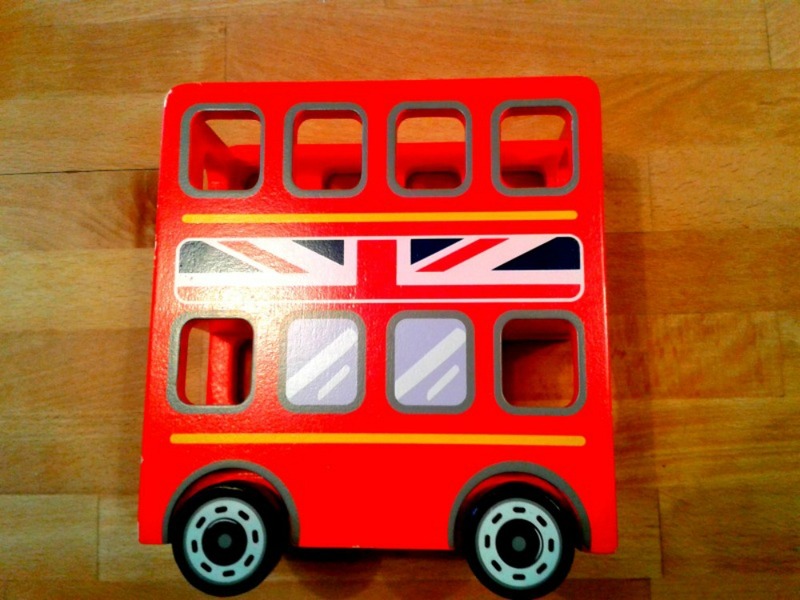 One toy that is getting a lot of attention and seems to be growing in popularity is this lovely wooden double-decker bus. I like the traditional design and the materials. I am hoping at this point that wood is better than plastic but I know that might not be right so feel free to tell me otherwise. The bus is chunky and quite heavy so wouldn’t be suitable for a baby who might topple it onto themselves. They need to be able to sit up well to play. And ideally be crawling because of course a bus has wheels and much of the fun comes from trundling it about. When Baby B first opened the bus at Christmas and finished playing with the box, all he did at first was tip it over, tip out the little passengers and lose interest. At that point he was nine months and two weeks old. So I’ve found it fascinating to see him move on to opening up the lid of the bus, take out the people and spend a few minutes sitting examining them. There is still no putting the figures into the bus. This extends to all containers; it’s always about emptying them out! In fact this bus has had a lot of accidents. If I were one of those people I’d be walking to work. 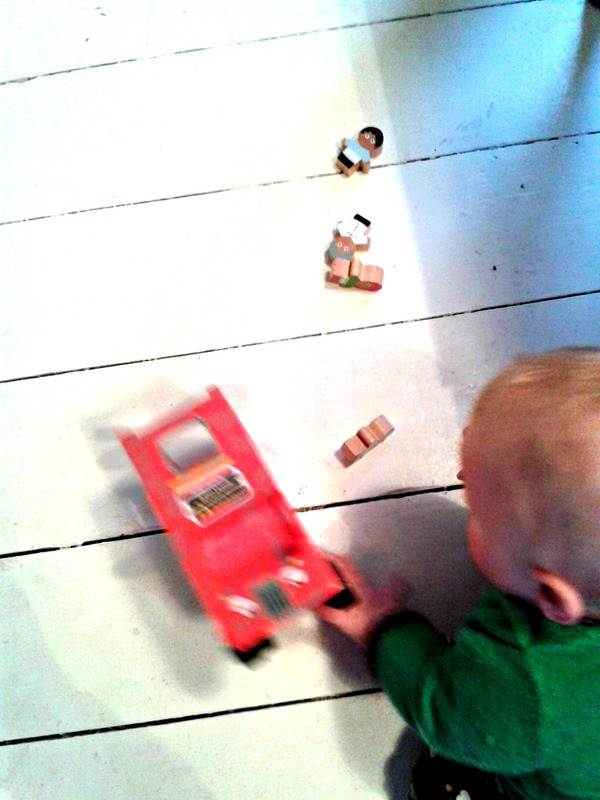 Last week for the first time he started pushing the bus around and crawling after it, with some demonstrations by me. Yes, I confess I was having more fun than Baby B at first. As the months go by and our baby becomes a toddler I am hoping the bus will become a firm favourite and eventually see his imagination come to life, once he is able to recognise it as a bus and the little objects as pretend people. The bus isn’t that hard-wearing, there are already a few scuffs and chips. That would be my only negative point but I don’t know if there is any way to avoid that. Perhaps that’s why plastic is popular as it’s better able to withstand the bumps and scrapes. I know that play is all about exploration and figuring out why something happens. And it’s the same reason babies throw their food on the floor. Sigh. But what I am seeing in the past few weeks is what looks to me more like a little person deciding to spend time having fun, rather than randomly exploring his world. I can’t wait to play with him more! Any recommendations for what I should buy him? 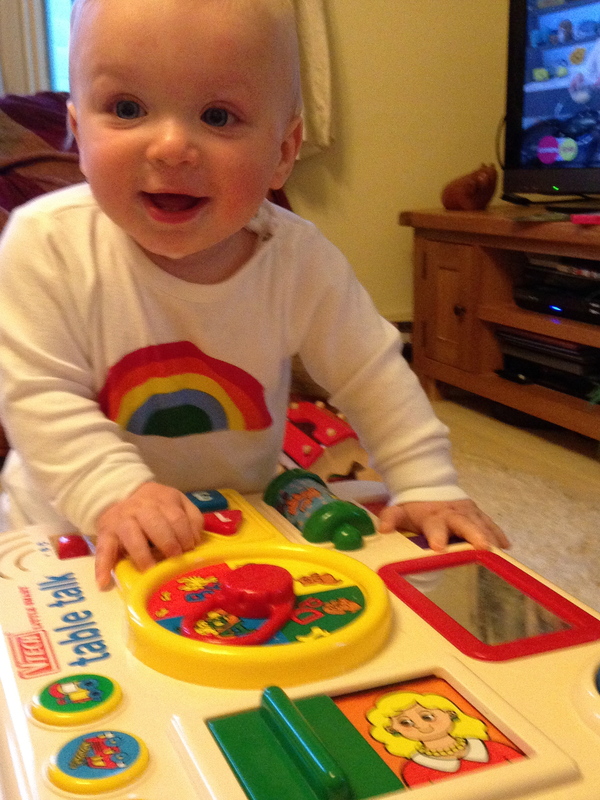 What were your favourite toys for babies around one year old? You can buy the bus from John Lewis. But this is NOT a sponsored post.